I didn’t make a lot of cake yet. The only cake experience I have are the frangipane tart, a couple of cheesecakes and one lemon pie for my birthday. A real birthday cake, however, I never made. There is a first time for everything, so last week I promised to make a birthday cake for a friend’s birthday party. 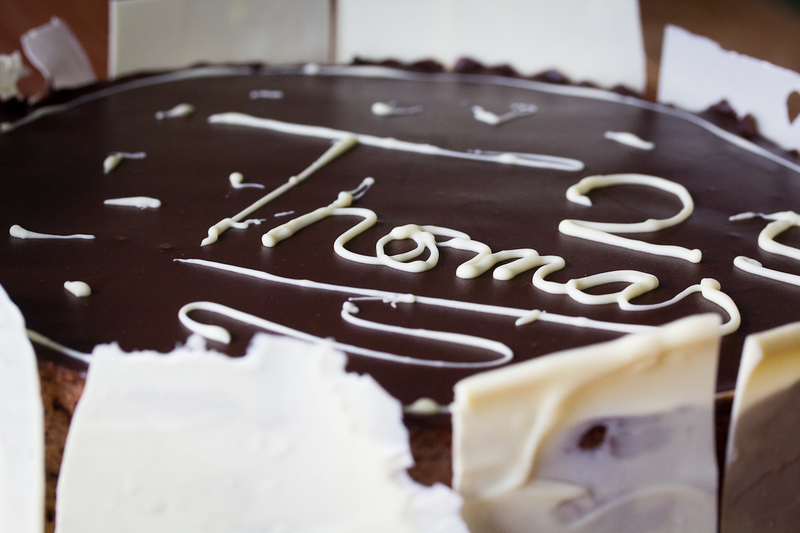 According to his girlfriend, the friend was addicted to chocolate. So I made a chocolate cake. Be aware, the cake is pretty heavy. 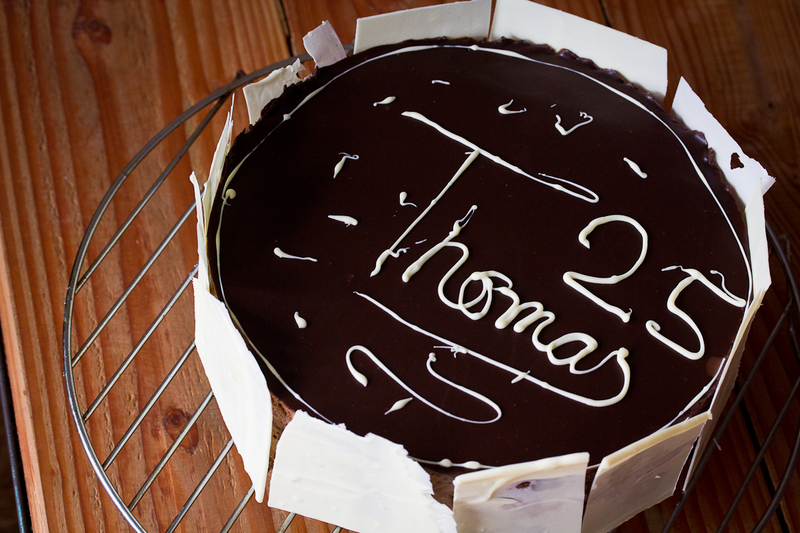 I used a cake mould of 24 centimeters. This was enough for 30 people. I admit, they didn’t ate a big piece. So let say that you can offer 12 to 15 people a nice piece of the cake. Don’t show up with this dessert after a four-course meal of course. Otherwise, they probably will explode. I think this is a perfect cake on a Sunday afternoon in winter. Gather together, drink a cup of coffee, play Risk and eat chocolate cake. Perfect! Start the day before with the crispy bottom (1). Melt the chocolate in a bain-marie. Add the hazelnut paste and stir with a whisk. Finally, add the pailleté feuilletine and the crispy rice. Take the mould and pour the mixture in the mould. Place in the fridge. Now we make number 4, the chocolate cake batter. Melt the chocolate in a bain-marie. Whip the cream until you have a kind of thick yogurt. Place in the fridge. Mix the egg yolks and the water with a whisk. Add to the melted chocolate. Add 1/3 of the cream to the chocolate. Add the other part of the whipped cream with a spatula. Beat the egg whites, when beaten add the sugar. Beat till the sugar is dissolved. Add the egg whites to the chocolate mixture. Place in the fridge. The third thing we will make is the chocolate biscuit (2). We need two times a round chocolate biscuit of 24 cm. Beat the eggs up in a till the eggs are foamy. Add the sugar while still whipping. Add the flour with a spatula and cacao. Take a griddle covered with baking paper and pour your mix on the griddle. Be sure that it’s big enough for your cake mould. Bake it in the oven for about 10 minutes on 175°C. If your oven is not big enough for two griddles, you have to do this twice, of course. The fourth thing we’ll make is the sugar syrup (3). Add the water and the sugar to a pot and bring it to the boil. Let it boil a bit and cool down. Now we can start building our cake. Take your cake mould with the bottom. Add a first layer of chocolate batter. Then add a biscuit. Brush it carefully with the sugar syrup. Add again some chocolate batter, a biscuit layer, sugar syrup and finish with a third layer of chocolate batter. Put your cake in the fridge for one night. 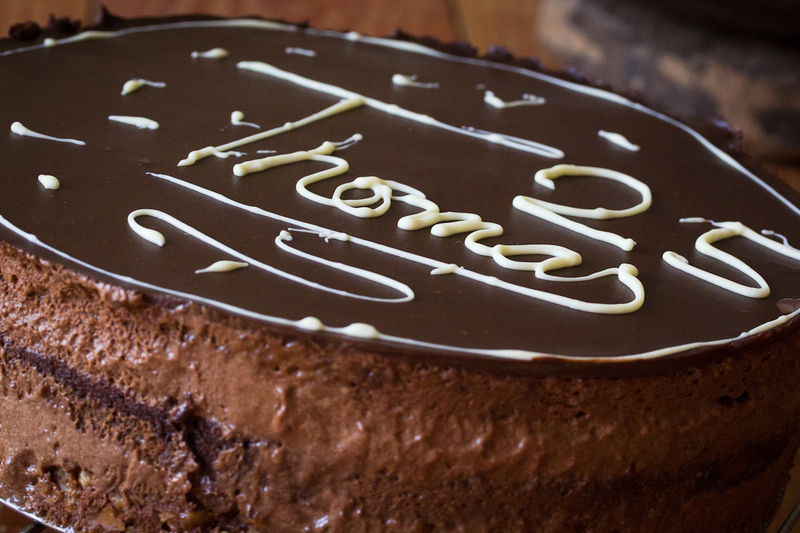 The next morning you can make the ganache (5). Melt the chocolate in a bain-marie. Bring the glucose and the cream to the boil. When the cream boils, pour it over the chocolat. Stir with a spatula. Turn off the heat. Cut the butter in small pieces and add to the chocolate. We use the butter to have a shiny layer. Stir till the mixture is smooth. Heat it again, but the ganache shouldn’t be more than 37°C. How can you know this? Touch the chocolate with your lips. 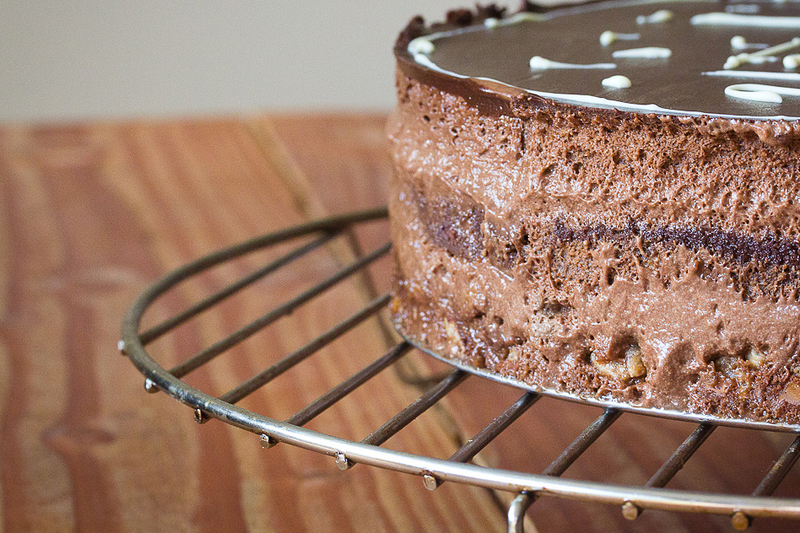 When it doesn’t feel too hot, it’s almost your body temperature, so that’s ok. Pour the ganache over the cake. Be sure that the layer is very tin. Put it in the fridge for at least 30 minutes. The last thing you have to make is the decoration of white chocolate (6). I made two things. The first thing is the name, the second thing are the white sheets. Start with melting the chocolate in a bain marie. Don’t stir or the chocolate will get grainy. When melted, pour in a piping bag. Then you can draw the name. 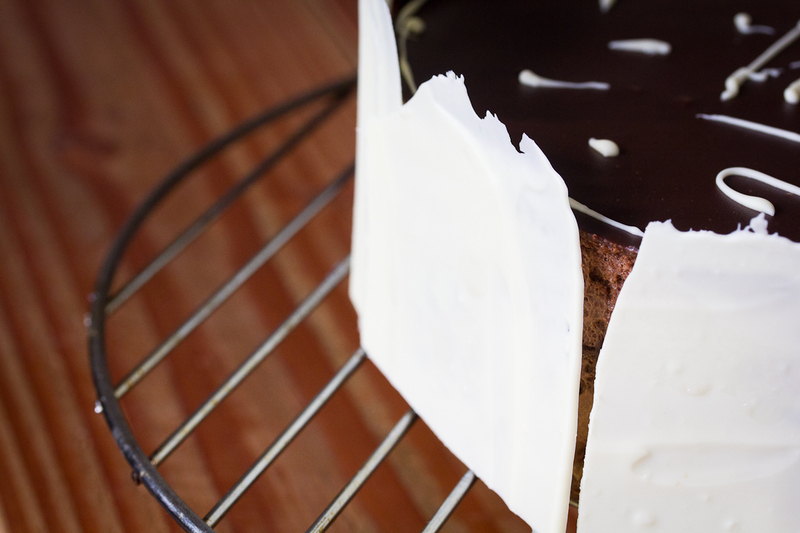 If you want to make the white sheets of chocolate, take baking paper and fix it on a baking plate or a cutting board. Pour the white chocolate on the baking paper. Be sure that the layer is very tin, f.e. half a millimeter. Place it in the fridge till it’s stiffen. Cut it into different sheets and paste to the cake. Buy some candles and let the party animal blow! Recipe is based on “Kookbijbel voor de hobbykok”, by Spermalie, p. 462-464.